On frequent occasions during this project I come across albums I have no idea how or why I have them. Unfamiliar with Ms Williams as I am, I attempted to listen to the album. Just for you. Yes. this is the kind of stuff I do for webkind. Wikipedia describes Williams as: “an American rock, folk, blues, and country music singer and songwriter”. An accurate description I’d say. 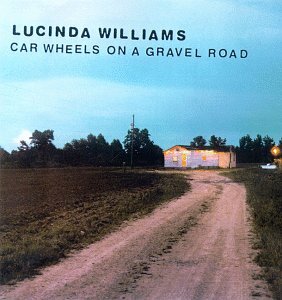 Car Wheels is Williams’ breakthrough fifth album which was released in 1998. I can’t say I’m a big fan of Country. Some people point at me and say something dumb like “uhhh you like Chris Isaak, Chris Isaak is country”; but if Chris Isaak is country, I’m an avant garde hipster. This is the kind of music you might expect to hear when you enter one of those road houses you might find on remote Arizonan or Texan highways. The kind of place everyone wears gingham and rides horses. The kind of place where the women have big norks and a long list of divorced husbands. Its here, in the bar where you might sip a glass of bourbon and ice while watching the singer on a stage who joins you at the bar after the show. The singer would then probably invite you to join them on some drug run or illegal car race. You’d probably end up sleeping with the singer too before dying horribly at the hands of a bunch of radioactive, mutant, hillbilly cannibals.